This gently humorous award-winning picture book deals sensitively with childhood fears. 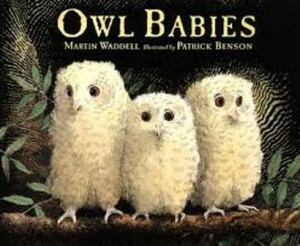 Three baby owls, Sarah, Percy and Bill, awake to find themselves alone in the dark forest. Their owl mother has flown off in search of food but they worry she may not return and each has their own way of coping with their fears. All is well when the family is reunited at the end of the story, to the visible delight of little Bill. Before reading the book, encourage children to look at the cover and talk about what they see. Then read through the story pausing before the end to think together about what will happen to the baby owls. What do children hope will happen? What don’t they want to happen? As you reread the book, encourage children to join in where they can. Perhaps by chiming in with Bill’s refrain, “I love my mummy”. By rereading the book together, children will become more familiar with the story and join in with more of the reading. There’s a lot to talk about in both the story and illustrations. You can reassure children that, like mother owl, you always return home to them, too. Using the pictures, encourage children to retell the story in their own words. Start them off by telling the story yourself, using the pictures on the first few pages. Children can make up a story about mother Owl’s night-time adventure. You can write down their story or help them write it themselves if they’d like to. Children can draw their own pictures to illustrate the story and then you can enjoy reading it aloud together. Make a simple book to illustrate and record information about different kinds of owls. Use the internet (see below) or library books to find out about the owls. 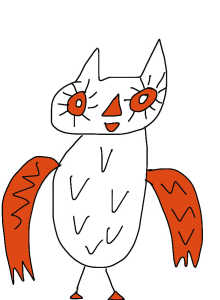 Children can use lolly sticks or twigs to make simple owl puppets. From a piece of card, cut out three baby owl shapes and one large mother owl shape. If you wish you can download a template here. Draw or paint owl features on the card, using the book illustrations as a guide. Glue an owl shape to each stick and use them to retell and act out the story together. Children can invent new stories about the baby owls. Find out more about owls here and here.